NSS Labs recently put over 20 endpoint protection vendors to the test for the 2018 NSS Labs Advanced Endpoint Protection Report. This year, Trend Micro received a ‘Recommended’ rating, demonstrating highly effective threat detection techniques, low false-positives and low total cost of ownership. NSS Labs has increased the intensity of its testing methodology, and Trend Micro’s Smart Protection Suite continues to perform well with a blend of cross-generational threat detection techniques and advanced capabilities. 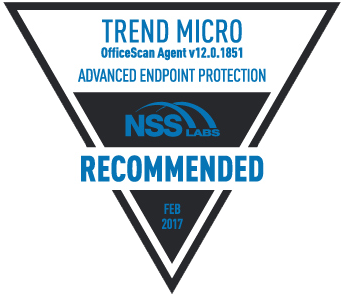 To learn more, download a copy of Trend Micro’s 2018 NSS Labs Advanced Endpoint Protection Report. Trend Micro goes beyond next-gen endpoint security to detect and respond to all types of ever-evolving threats with advanced capabilities like pre-execution and run-time machine learning, behavioral IOA detection and exploit detection.